Reactive hyperaemia or post- ischemic reactive hyperemia is the increased blood flow to an organ or a tissue following a temporary blockage of an artery. 1. Through a response with release of vasodilatory substances such as adenosine, carbon dioxide, adenosine phosphate compounds, histamine, potassium ions and hydrogen ions. 2. Hyperemia could be caused by a lack of oxygen which could affect opening of more precapillary sphincters in the affected tissue, thereby increasing blood flow. 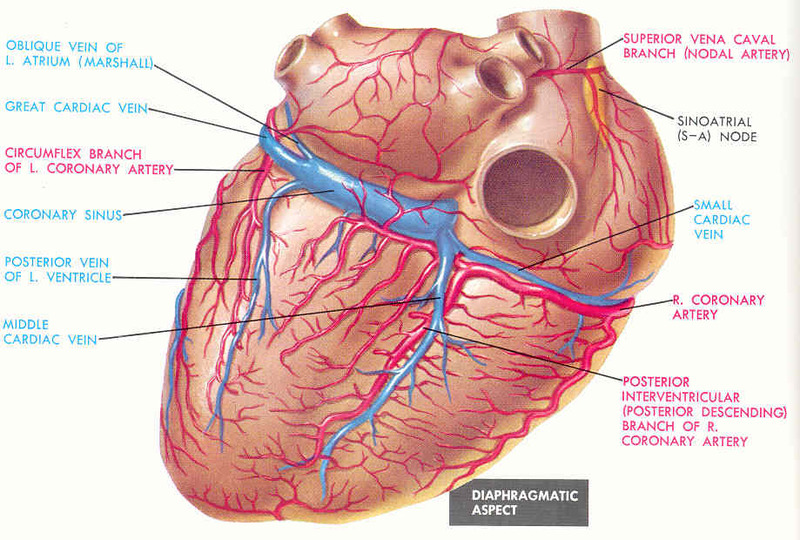 During a coronary artery occlusion, the area of the heart supplied by the artery is deprived of its blood-supply. Upon reperfusion there is a dramatic rise in coronary blood flow, far above the baseline flow prior to the occlusiOn. The mechanism for this enormous increase in flow during reactive hyperemia is somewhat of an enigma because the incurred oxygen debt does not in itself justify the flow increase . Several factors have been implicated, and the mechanism is now thought to be multifactorial in origin. Several substances (adrenalin, ADP/ATP, substance P, bradykinin and to some extent also adenosine) activate receptors on the endothelium of the coronary artery, stimulating release of nitrous oxide (NO), prostaglandins and endothelium-derived hyperpolarizing factor (EDHF), that in turn cause relaxation of the underlying smooth muscle cells (SMC). Adenosine stimulates SMC relaxation directly by acting on specific receptors (mainly A2A) on the SMC33. K+ATP channels are regulated by the cellular metabolic state and when they are activated the SMC is hyperpolarized, which causes relaxation. Thus, the K+ATP channels could provide a link between intracellular ischemia and vaso-relaxation. Indeed, the K+ATP channel inhibitor glibenclamide has been shown to inhibit a part of the reactive hyperemia . The effect of adenosine, prostaglandins, and NO during reactive hyperemia in coronary vessels has been studied with use of specific receptor blockers (NOS-inhibitors, adenosine receptor antagonists, and cyclo-oxygenase inhibitors), and it has been found that there still exists an unaccountable rise in blood flow during reperfusion 41-45. Reperfusion injury is hypothesized to be the additional myocardial injury sustained by the heart during the process of reperfusion of an infarct-related artery. Is certain is however that in patients with ongoing STEMI, the earlier reperfusion takes place the more myocardial tissue is saved and mechanical reperfusion seems to save more myocardial tissue than reperfusion through thrombolysis. Four hypotheses of mechanism that do a reperfusion injury: arrhythmias, stunning, lethal reperfusion injury (cell death) and accelerated necrosis. Other proposed mechanisms of reperfusion injury include calcium overload, complement activation, mitochondrial injury, effects of oxygen-derived free radical generation, increased osmotic stress, endothelial dysfunction with reduced flow and neutrophil activation. 2.	infarction–with irreversible cell death. 3. In addition, reperfusion is associated with potentially lethal arrhythmias that are rapidly and predictably induced within seconds of the onset of reflow]. A number of mechanisms have been proposed to mediate reperfusion injury. The term “free radical” is used to define an atom or molecule that can exist independently with one or more unpaired electrons. By virtue of their unpaired electron, free radicals are typically unstable, highly reactive, and short-lived. 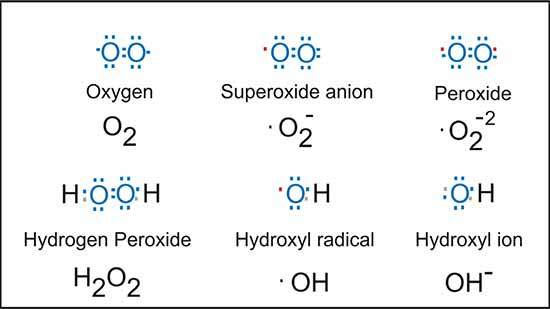 Oxygen-derived free radicals and oxidants (reactive oxygen species, ROS) are formed continuously in small amounts during the normal metabolism of cells and are normally inactivated by endogenous scavenging mechanisms. The increased generation of free radicals and oxidants during ischemia and reperfusion has been demonstrated. ROS may injure cells by causing peroxidation of membrane lipid, denaturation of proteins including enzymes and ion channels, and strand breaks in DNA. Lipid peroxidation triggers loss of membrane integrity, necrosis and cell death. Lipid peroxidation occurs upon reperfusion, and can be prevented when oxygen radicals are inactivated by specific scavengers . Oxidative damage by ROS has been documented in a number of experimental studies from subcellular and cellular to in vitro and in vivo models and also in humans. Nitric oxide (NO) produced by NO synthase (NOS) is an important regulator of vascular and cardiac function. NO released from the vascular endothelium by endothelial NOS (eNOS) is the major source of NO in the myocardium under physiological conditions. It has also been demonstrated that eNOS is present in cardiac myocytes. NO has been reported to regulate myocardial oxygen consumption. Nitric oxide (NO) contributes to peak reactive hyperemia. The flow increase after reperfusion is probably due to mechanisms as the adenosine (endotelio indipendent).Any case NO has surely an important rule to extabilish the vasodilatation time. A important study* has show that hypothermia during ischemia reduce myocardial reperfusion injury. It establish the cardioprotective effect of very mild total-body hypothermia and determine whether the application of hypothermia at different points during the ischemia-reperfusion period influenced the degree of myocardial salvage. Rabbits were subjected to 30 minutes of myocardial ischemia followed by 3 hours of reperfusion. Twenty-five animals were maintained at normal temperature (39.5 degrees C) throughout the experiment (W-W-W group). All other animals were cooled to reduce left atrial temperature 2.0 degrees C to 2.5 degrees C. Eleven animals reached goal temperature before coronary occlusion (C-C-C group), in 14 animals cooling was initiated at coronary occlusion (W-C0-C group), in 8 animals cooling was initiated 15 minutes after coronary occlusion (W-C15-C group), in 5 animals cooling was initiated 25 minutes after coronary occlusion (W-C25-C group), and in 13 animals cooling was started concurrently with reperfusion (W-W-C group). Infarct size as a percentage of the risk area (I/AR) was determined by a double staining-planimetry technique. Goal temperature was achieved before reperfusion in the C-C-C and W-C0-C groups but was not achieved until the reperfusion period in the other treatment groups. Infarct size was 59.0 +/- 1.2% in the W-W-W group and was reduced in all cooling groups (C-C-C = 30.4 +/- 4.9%; W-C0-C = 33.4 +/- 5.0%; W-C15-C = 42.4 +/- 1.4%; W-C25-C = 44.1 +/- 2.3%; W-W-C = 50.5 +/- 4.1%). The temperature at reperfusion correlated most strongly with infarct size (r = 0.72, p < 1 × 10(-12)). The mechanism by which mild hypothermia of the reperfusate limits myocardial injury is probably multifactorial. The pigs in the Otake and colleagues paper treated with hypothermia showed a greater coronary flow reserve (CFR) in the infarct-related coronary artery than normothermia-treated pigs after reperfusion. Because CFR can be used as an indirect parameter for evaluating the function of the coronary circulation , preservation of CFR in the hypothermia-treated pigs reflects better coronary microcirculation. Has been dimostrated that hypothermia significantly improves coronary reflow and reduces the no-reflow area. In addition to preserving microvascular integrity, hypothermia has been associated with a wide range of additional protective mechanisms, which may ameliorate ischemia-reperfusion injury. These include the induction of heat shock proteins, reduced apoptosis, decreased complement activation, and a reduction in neutrophil degranulation. Although the broad spectrum of hypothermia-induced effects makes it difficult to pinpoint the exact mechanism of protection, it may be advantageous since pharmacologic therapies targeting a single mechanistic pathway have been ineffective adjuncts to reperfusion in clinical trials. This fact have important clinical implications. Although the effectiveness of profound myocardial hypothermia during cardiac surgery indicate that colder temperatures induced very early after the start of ischemia are likely most cardioprotective. Several studies also suggests that very limited hypothermia, especially of the reperfusate, could be an effective adjunct to reperfusion therapy for IMA. P2Y receptors are a family of purinergic G protein-coupled receptors, stimulated by nucleotides such as ATP, ADP, UTP, UDP and UDP-glucose. Several studies showed that the endothelial P2Y1 receptor release vasodilatory factors in response to ADP. Then these receptrs might play a vital role in the regulation of coronary flow. MRS 2179, a selective P2Y1 receptor blocker, significantly reduces the increased coronary flow and reactive hyperemia in coronary arteries. Thus, ADP acting on the endothelial P2Y1 receptor may play a major role in coronary flow during post-ischemic hyperemia. Red blood cells release ATP in response to ischemia. 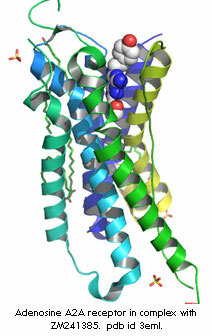 ATP is then rapidly degraded to ADP, which in turn binds to the vascular endothelium at the site of the P2Y1 receptor. The selective P2Y1 receptor agonist 2-MeSADP* induced a predicted increase in flow, which could be completely abolished by co-infusion of 2-MeSADP and the selective P2Y1receptor blocker MRS 2179. In contrast, UTP, which activates P2Y2/4 receptors, stimulated a flow increase that was unaffected by MRS 2179, demonstrating the selectivity for P2Y1 receptors of MRS 2179. To test the contribution of P2Y1 receptors to post-ischemic-hyperemia, the LAD* was occluded, and MRS 2179 was infused into the ischemic portion of the heart supplied by the LAD. The 46% reduction of peak flow achieved during reactive hyperemia indicates that P2Y1 receptors are of major importance as an activator of endothelium-derived smooth muscle cell relaxing factors such as NO and EDHF. NO and EDHF has been shown to mediate a major part of early reactive hyperemia , and both are released by ADP acting on P2Y1receptors . A2A and A2B receptors contribute to coronary vasodilation. A2A receptor pathway playing the predominant role. In particular, inhibition of A2A receptors significantly reduced the increase in coronary blood flow to the highest dose of adenosine. It is important to recognize that inhibition of A2A and/or A2B receptors failed to significantly diminish resting coronary flow (Table 1). A2A receptors contribute to coronary reactive hyperemia, as inhibition of A2A receptors with SCH58261 reduced repayment of coronary flow debt (+\-32%) . Although earlier studies indicate that the mechanisms of coronary reactive hyperemia are dependent on species, experimental preparation and the duration of coronary occlusion. SCH58261 resulted in an 20-30% reduction in the coronary reactive hyperemic response in isolated mouse hearts. fig:coronary vasodilation in response to A2A receptor activation with CGS 21680 was markedely attenuated by inibition of k channel whit 4-AP and KATP channel whit glibencamide. Numerous earlier studies have demonstrated that adenosine and A2receptor signaling converge on KATP channels. Both KATP and K channels have been shown to modulate coronary vasodilation in response to cardiac ischemia. Coronary vasodilation in response to A2A receptor activation is mediated via signaling pathways that converge on both KATP and K channels as inhibition of either K channels or KATPchannels markedly attenuated vasodilation in response to CGS 21680. Importantly, the decrease in the coronary reactive hyperemia following inhibition of K and KATP channels (+\-60% reduction) was much greater than the relatively modest effect A2A receptor blockade alone. This indicate that while A2A receptor signaling is a component of K and KATP channel activation in response to cardiac ischemia, numerous other pathways must also converge on these channels to mediate the marked increase in coronary blood flow following a brief episode of cardiac ischemia.